The policy means that tenants have their housing benefit reduced by 14 per cent if they have one spare bedroom, and 25 per cent if they have two or more spare bedrooms. 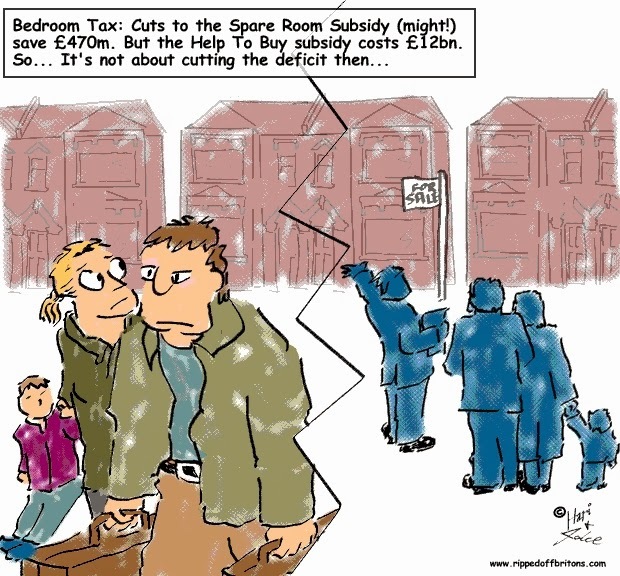 Yet more than 19 out of 20 families hit by the bedroom tax are trapped in their larger homes because there is nowhere smaller within the local social housing stock to take them. SOURCE BBC NEWS: Strong start for Help to Buy, say lendersTwo major lenders have reported a strong uptake in the first month of the government's extended Help to Buy mortgage guarantee scheme. But critics are concerned it could help to create a UK housing bubble.